Barel Karsan - Value Investing: What Should Home Sales Numbers Be? We constantly hear reports about home sales being far lower than they were at the peak of the housing boom. But under normal economic conditions, should we expect a rebound in home sales, or are they still higher than we can support on a sustainable basis? Based on this graph, it would seem that despite the fact that annual home sales are far lower than they have been, they are still above average (of 1.49 sales / 100,000 people) for the last 40 years. However, the average may be a bit deceiving, as the trend line over the last 40 years appears positive. Obviously, it cannot continue to be positive forever, as that would mean that at some point in the future, we would all be moving every month. However, some demographic factors (smaller families, more affluency etc.) suggest that we probably move more often now than we did 40 years ago. 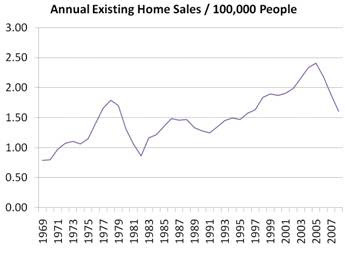 Therefore, a more reasonable proxy for what home sales would be under normal conditions may be the years just prior to the housing boom, where they hovered around 1.9 sales / 100,000 people. A better model for predicting existing home sales may include other variables, but based on this analysis, whenever it is that financial conditions stabilize (credit returns to normal, house prices stabilize), we may expect home sales to approach 1.9 per 100,000 people, which is about 5.8 million sales per year, higher than the current 4.9 million sales per year pace we're on for 2008.